There are several reasons why one would need to remove the background from an image. When we shoot photos, we do not always have the control of the scene and when after we look at the photo we wish that it was somehow different or even to be able to edit and make it as we want. By changing or removing the background, a photo may look totally different. The background can be totally removed and keep only a certain element in the photo, and then can be further edited and we can apply several other effects to make any photo as we want. Removing the background of an image and replacing it with a different one you want for your needs, gives the ability to totally transform photos and make them look as you want. For example, you can keep a person in a photo with a landscape background and put it on any background. This ability can make the photo look totally different if the background gives a motion to the photo, or has different colors and contrast and so on. So to remove the background from an image gives many advantages on how we want to present an element or a person or anything else we want from a certain image. And there are many cases you may need or want to remove the background from your images. If you do Powerpoint presentations, you would need to make them look professional and the photos you will be using should look professional too. It would be much nicer for your viewers to watch your presentations with nice and clean graphics, than with graphics that have ugly or irrelevant and distracting background. Another good reason to remove the background from an image is when you want to sell your product online through your webshop or through any third party`s website like Amazon, eBay, google shop. As more beautiful, clean and distraction-free your product photo looks, as more you increase the possibilities to make more sales. Using product photos that have irrelevant, ugly and include any kind of distractions background, is like shooting your own business. As well as sites like Amazon require product photos to comply with their regulations. Removing the background of images and present nice, clean photos that display a certain element in the photo can be an important factor to succeed with an online business. Making your photos focusing on a certain element, a product, for example, will easily get the attention of the viewers and will make them click on that photo. That means they will go where the link of the photo drives them to, and if this is your website or product listing for sale, you will acquire a potential buyer! People love to see beautiful photos and graphics and prefer to click them then click on ugly, distracting photos. With the evolution of the photo editing tools, to remove the background from an image is not such a hard thing to do when you know how, and if the photo doesn`t need complex editing. Tools like Photoshop, Gimp and more can help edit and remove the background from any image. There are also several websites in the web like us here in BravoClipping who provide background removal service and can do the job and remove your image`s background. And is a great choice when you have a lot of images that you want to remove their background, as they will save you a ton of time while they will offer you great results. 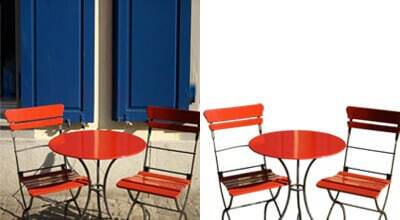 Learn more about different ways to remove the background from an image depending on complexity, and why, by removing the background you can increase your online sales.